There are 6 replies in this Thread. The last Post ( Jun 8th 2018 ) by Michael. Download the full image, preferably 58Mb PNG one (zooming is smoother as its about twice the resolution), and enjoy the view of 1 700 000 000 stars with other galaxies, asteroids and dust between us and them as bonus. thats the milkyway or the entire visible universe? I think its the entire visible universe, because it looks like a "visible" universe from our point of view, far out galaxies are just not visible for an image/normal light waves, just detectable with other kind of tools. 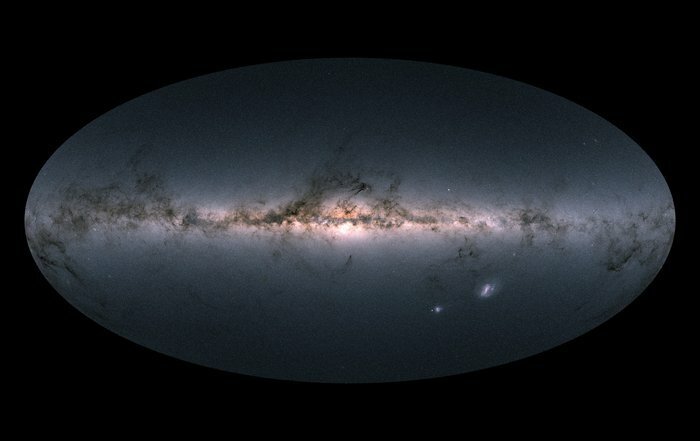 Unlike the other map of the known universe which shows a 3D model of it (more or less) where milky way is somewhere in mid of nowhere, this image is all the lights of everything visible from Earth's sky, as it mentions "Gaia’s all-sky view of our Milky Way Galaxy and neighbouring galaxies," and later on "The two bright objects in the lower right of the image are the Large and Small Magellanic Clouds, two dwarf galaxies orbiting the Milky Way. " and some area which was filled for not having enough data from it or so. Also on the star density version of it, it specifies "The elongated feature visible below the Galactic centre and pointing in the downwards direction is the Sagittarius dwarf galaxy, a small satellite of the Milky Way that is leaving a stream of stars behind as an effect of our Galaxy’s gravitational tug. This faint feature is only visible in this view, and not in the all-sky map based on the luminosity of stars, which is dominated by bright sources." and "Sprinkled across the image are also many globular and open clusters – groupings of stars held together by their mutual gravity, as well as entire galaxies beyond our own. " So it mentions there are many galaxies in there just hardly visible for being covered by brighter light sources + distance. Should be an entire visible universe not Milky Way only then. Edited once, last by Michael ( Jun 8th 2018 ). The expression visible universe is not related to your abilitiy to see something. Don't want to end with an escape pod and a wrecked ship? No Pirate will get in your way then, that's for sure!